Firstly I want to thank everyone who sent me emails and comments expressing their concern and how they missed me. I am incredibly touched and surprised by all the well wishes and apologise for worrying you guys. It has been an incredibly busy period which was not helped by a relapse in a chronic health problem. I am recovering still and trying to balance the workload, health and sanity. So apologies for the posting hiatus here - I will try not to have such long absences. I will respond to each and every email and comment shortly so please bear with me ... and now to the post proper (sic). It’s always an adventure dining out with a date. The tentative, gentle exploration of each other’s culinary preferences. The uncertain compromise and relief that the first hurdle was resolved amicably. It helps if it’s with someone with whom you have dined before in the most inebriated state and still managed not to send him running for the hills at the sight of your ravenous foraging. I've had the misfortune of researching a series of “dates” in the course of my work recently and have had to recruit hapless but safe male friends to undertake this hazardous mission with me. It has been a minefield of potentially awkward misunderstandings, scrupulous avoidance of mixed signals and heightened stalker radar alertness requiring every ounce of my beleagured diplomacy skills and fleet footedness. The stress level is extremely high and would be hilarious if I did not feel so endangered. My encounters with M always revolve around food or music. Since our first meeting and immediate gravitation towards each other because of music, we’ve managed to find many other common grounds despite our seeming differences. So every time M makes his monthly or so business visits to Singapore, we inevitably end up going on a food and music expedition. In between, we discuss everything from art to medicine to dance to religion and philosophy with the main themes always being food and music. He was ideal as the first victim of my mission improbable. 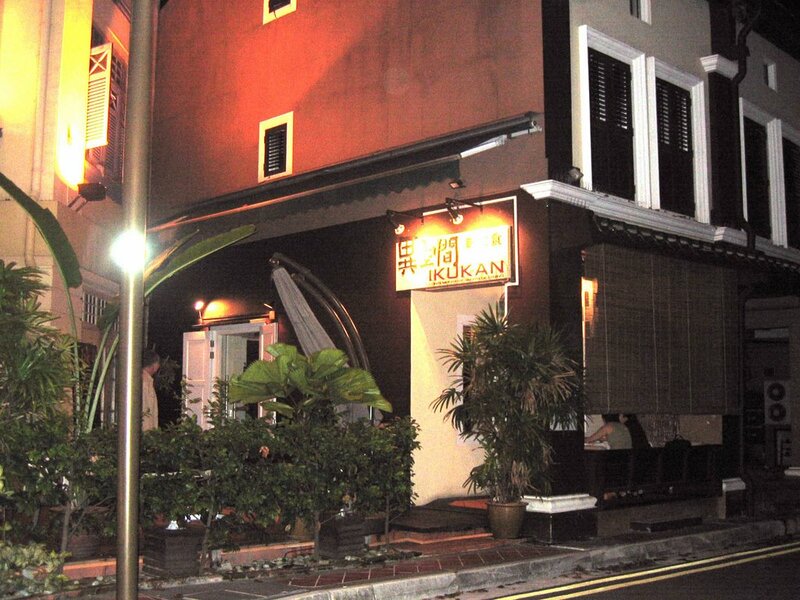 The latest culinary trail led us to Ikukan – a serendipitous choice made almost simultaneously without prior consult. 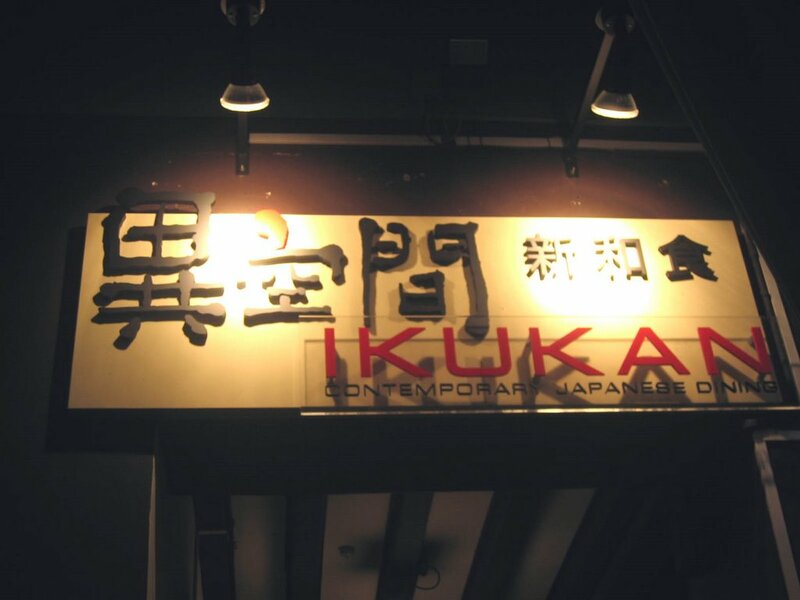 My last visit to Ikukan was eons ago when a local foodie friend herded four of us to this hidden bastion of Japanese cuisine for a sake and food tasting. None of us had been there before and we were eagerly anticipating a night of wondrous new taste sensations. At first, the location was rather suspect as he led us past a carpark right in the heart of the business district, into a small back alley. Surely there cannot be a restaurant in this dark, remote corner? 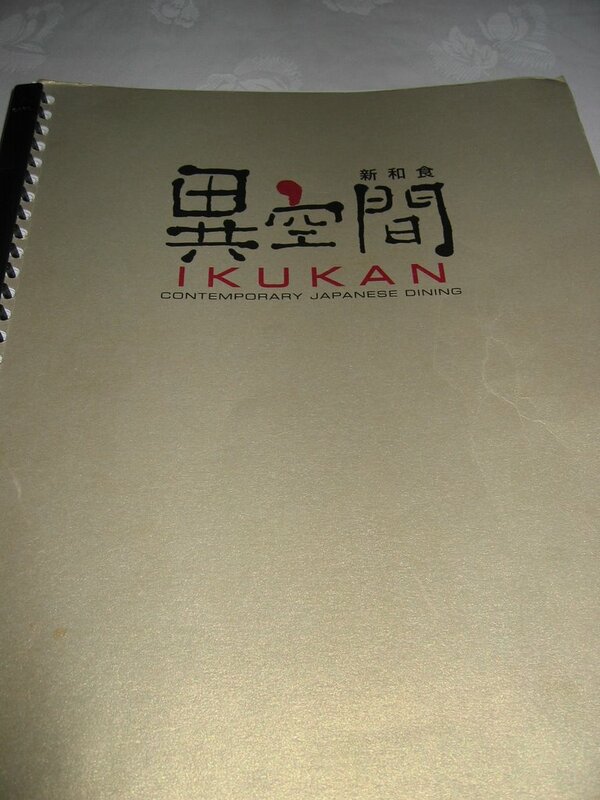 I did not know quite what to expect but it certainly was not the well appointed, quiet, simple elegance of Ikukan. Yes, there was the ubiquitious rice paper and bamboo partitions, the sake barrels and the creepy and cheesy waving cat that always looks like Chucky’s pet. But there was also a lovely, shaded outdoor verandah with lush greenery, soft lighting and clean lines. I did not expect such a romantic, almost tropical setting. It should have been slightly incongruous with the dignified serenity of the very Japanese indoor décor but somehow it worked. I really liked this little oasis of al fresco delight which looked out into the quiet alley. I remember thinking that it was a pity I was dining in such romantic surroundings with three blokes who are lovely but certainly not my idea of date material. And before you think I am up myself, two of them are married and the last one is like an uncle to me! My memory of Ikukan swirled with glossy images of spectacular sushi salads gleaming with glorious orange gems of roe, sashimi so fresh I could feel the sea breeze rifling through my hair, and sake so potent and abundant that I regretted wearing 3-inch heels that night as I tottered gingerly on the slatted tiles of the carpark on the way home. When M suggested that we go Japanese the night of his arrival, I immediately thought of Ikukan. But before I could utter the first vowel, he asked if I knew of a tiny little restaurant off Club Street. I was delighted and amazed at this psychic culinary connection and the happy decision was made. Sadly, because we did not make a reservation, we were unable to sit in the verandah. The staff took pity on our abject disappointment and set up a little table just off that so we could enjoy the cool night air and tasteful foliage. I decided against sake as that white lightning has a fast and dangerous effect on me and I wanted to enjoy M’s lively conversation as well as the food. In an unfashionable fit of patriotism, M requested for Italian wine. Unfortunately, Ikukan's wine menu did not extend to Italian wine which I thought was very odd since their sister restaurant right next door did. Turning his nose up at the inescapable French selection, and hesitant about the "new world wine" from Australia, M compromised on the Spanish selection, even though I thought the selection was below average. 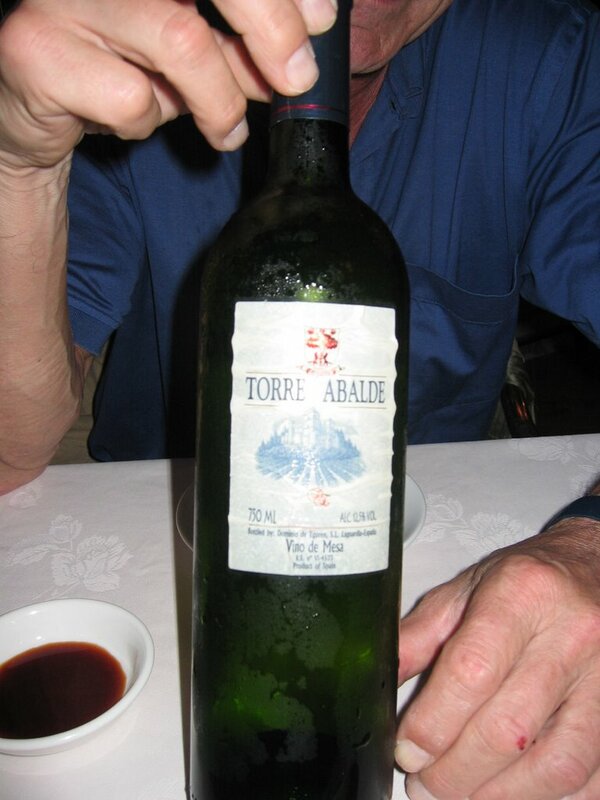 We ordered a relatively inexpensive white wine from Spain in the range of S$60-70 a bottle (those familiar to Singapore would snigger as even the cheapest plonk starts at the S$40 range in restaurants here). Am I terribly unromantic disliking dim lighting when I am scrutinising and trying to shoot my food and wine discreetly? By the way, M is well trained by now and will hold up food items to help out in the surreptitious photo shoots. The food choices were considerably easier as I was still waxing lyrical about Ikukan's sashimi salad. M happily agreed to this recommendation as long as he could order his saba grilled on volcanic ashes. I wondered if it was an indication of his ancestry – Pompeii, burning ashes and all that. But his choice was an informed one as Ikukan's saba is to die for. Having experienced their signature dish before, I was a willing accomplice in this fishy business. M and I did not let a single leaf, or vibrant orange gem escape our rampant chopsticks. We awarded this heavenly salad a 9/10. Appreciative moans and contented hums rang from our table and I think our server was rather amused by our beatific beams of satisfaction. Upon her recommendation, we decided to try the spring rolls. I know, we had the same reaction when we spied it on the menu. 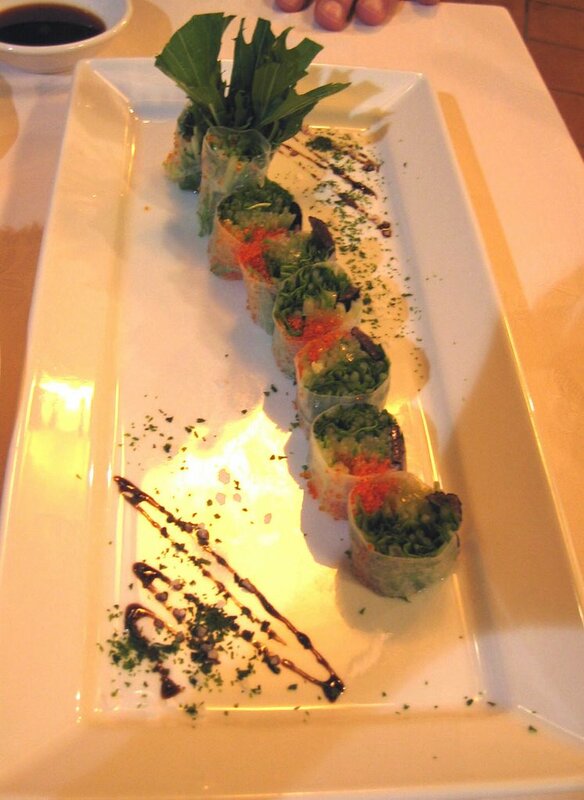 Spring rolls in a Japanese restaurant … how tacky. I have a distrust of spring rolls. Too often, it is offered in beyond mediocre, fake Chinese restaurants mangled by rancid, burnt overnight oil, stuffed with limp and putrid juliennes of leftover ingredients, and mummified by leathery, cement-like pastry skins. Unless the quality of the restaurant and chef are beyond reproach, I typically eschew this cruel torment. These spring rolls were done in a pseudo-Indochinese style. 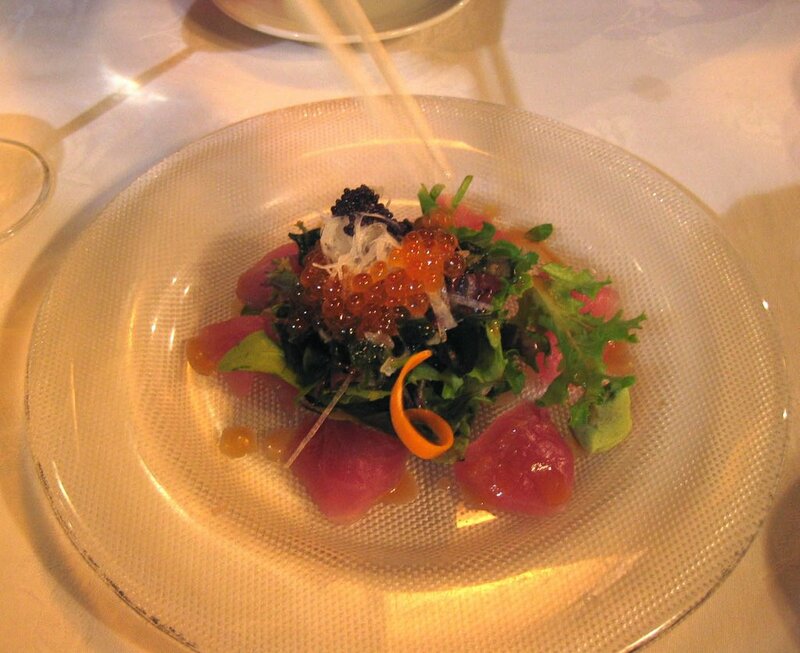 The menu and our server touted it's "gourmet fusion" of black truffle and mizuna leaves. Bit of the tired ole fusion business here but M and I were feeling adventurous. Alas, it did not assuage my constant grouse that too many chefs let the truffled perfumes of extravagant, epicurean delicacies go to their fluffy, mushroom-clouded hats. The mizuna leaves were much too hardy, intensely flavoured and tough for such a delicate concoction. The truffles were heavy handedly shoveled into the rolls with the unnecessary splash of truffled oil. The two battled for supremacy in a bitter contest of overpowering gaucheness. In no way was this dish subtle or refined. It was uncouth, tough, bland, unbalanced in flavours and texture and demonstrated a lack of understanding and appreciation of the ingredients. The only saving grace was the presentation. I thought this dish did injustice to Ikukan’s otherwise excellent quality and food philosophy and gave it a 2/10. I think they should remove it from their menu pronto and never let it see the light of day ever again. The next few dishes were much safer choices. The slivers of salmon and swordfish sashimi were beautifully and simply presented on glossy, organic-looking boulders of ice. The salmon was lovely but the swordfish was a disappointment. Perhaps the chef was having an off day or in a hurry to bugger off home because the swordfish was sliced with the delicacy and finesse of an axe murderer. Hey, Manson, cook much? The cut was inferior and it was much too fibrous and in uneven chunks. I was beginning to wonder at the inconsistent quality of Ikukan that night. It was obvious there were two chefs at work that night and one of them should have gone home before we got there. The final fusion dish was a much greater success, garnering a 9/10. 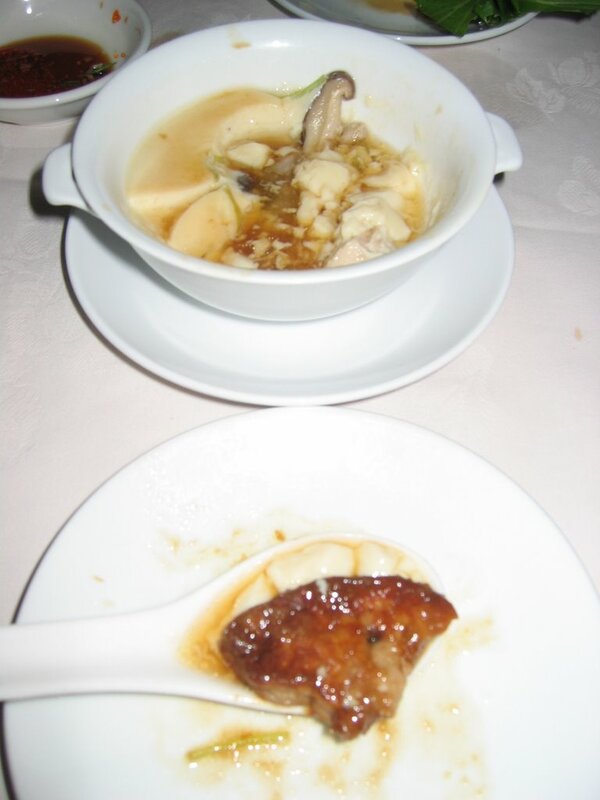 Spotting the foie gras chawanmushi in the menu, I ordered it with alacrity. Sadly, I have a terminal weakness for foie gras. The chawanmushi was tender and silky, making its sinuous journey down the throat a sensual pleasure. The foie gras complemented the delicate egg custard with its velvety unctuousness, and a generous gloss of nicely balanced sauce. Strangely, it struck me as having a more Chinese culinary undertone and oddly awkward and rustic in comparison to its other more sophisticated brethern. But note that while I was making these observations, I was still wolfing down every slippery spoonful. For lack of better words, it was bloody delish, compelling M and I to demolish this dish with a woeful disregard of table manners. I begrudgingly took a picture in the midst of this wanton carnage, giving M the opportunity to inhale more than half of it. I blame you guys for every bite denied me. Ikukan further redeemed itself with the next dish – its signature saba grilled in volcanic ashes. The well proportioned (i.e. big ... 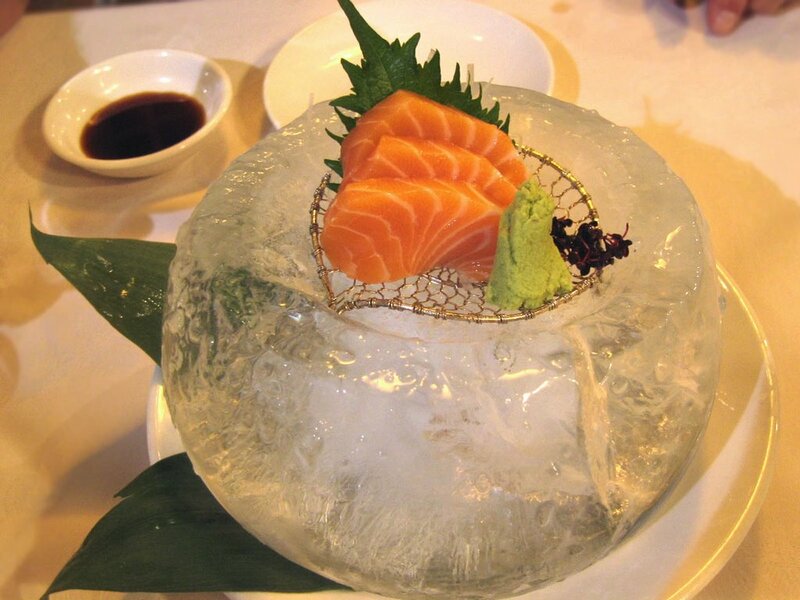 I like ...) whole saba, sans head, is a mastery in simplicity. 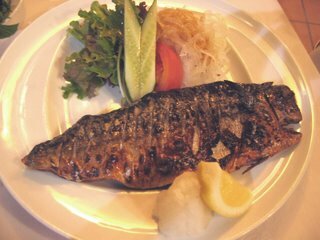 The freshest saba is grilled over volcanic ashes which impart a smokey aroma and flavour. 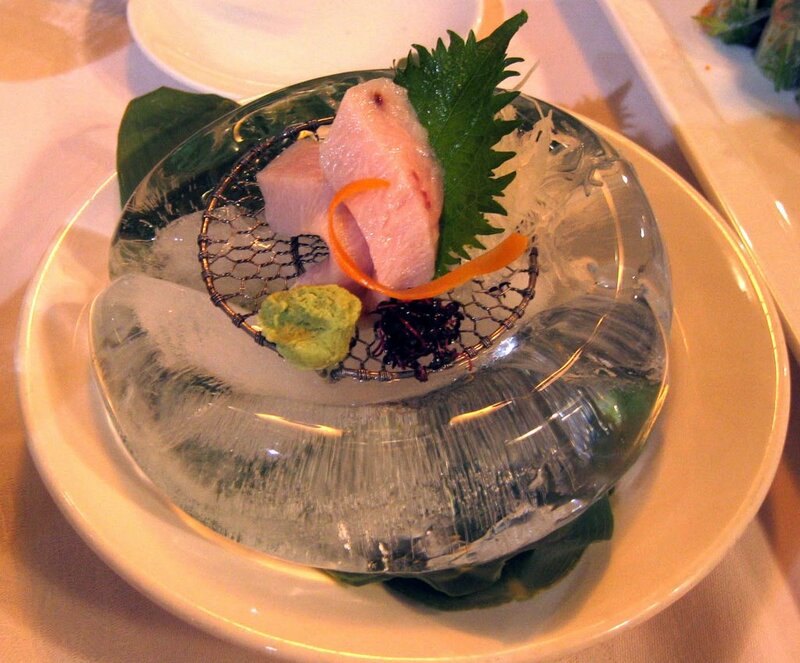 A restrained squeeze of lemon is the only adornment this wonderful fish requires. Tender, moist, flakey morsels bring the sweet essence of the sea and earth to every starving cell of your palate. I defy you to eat this without once closing your eyes in bliss with each delicious nuance. Conversation came to a halt as M and I slobbered over our saba. It was the only dish we refused to share and although I was completely stuffed three quarters into it, I still picked the fish clean. 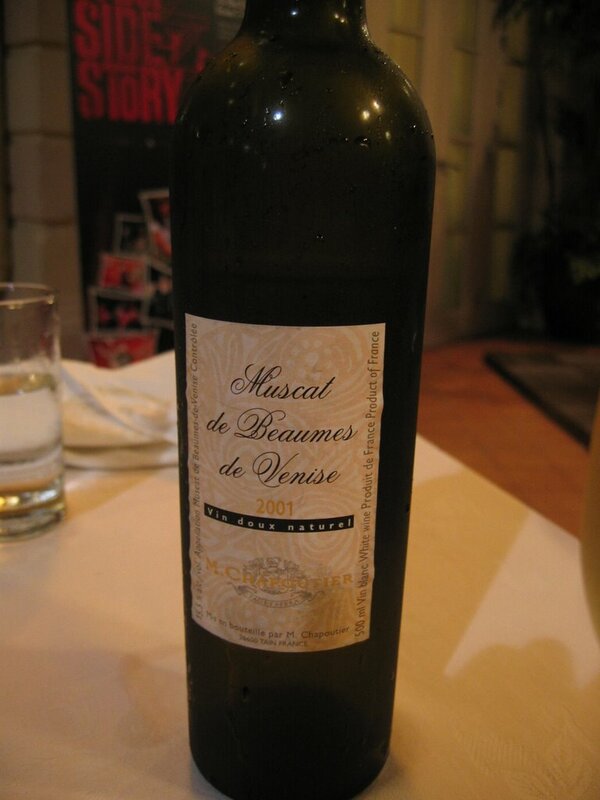 The rest of the meal passed in a satiated daze as we lingered over the memory and taste of the ash-burnished saba over a rather pleasant orange muscat and coffee. The night grew cooler but the volcanic rush of ecstasy over the luscious saba was a warm ember that was fuelled by good company, intelligent conversation and considerate service. Ikukan still entices me just on the merit of its sashimi salad and saba. Obviously I give Ikukan’s saba a 10/10 which helps pull up its overall score let down by the wine, spring roll and swordfish sashimi. The service is above average even if the staff is not terribly knowledgeable, a prevalent condition in Singapore. Taking that into consideration, I give Ikukan a 7/10 for service. Ambience rates a respectable 7.5/10 while quality of food warrants a 8/10 with portion size a 7/10. Value, which I define as whether the food and service warrants the price you pay, is about 7/10 – the black truffle and mizuna spring roll was blatantly over-priced at over S$30 for that sorely unimpressive assault to my palate. If you want to be pedantic, Ikukan scored an average of 7.3/10. It is still a worthy choice but Ikukan should stick to doing what they do best, i.e. contemporary Japanese, and leave the fusion stuff alone until they can ensure some level of consistency and sophistry in this area. I’d definitely go back but might give their “gourmet fusion” dishes a miss until they can convince me that they have refined these. Hi Stephanie...you were missed..hope you're feeling strong now! I'm glad to read that you're feeling better and that you're back to posting. Your review is brilliant. You should be a reviewer profesionally. Well done! i must eat at ikukan sometime. And order volcanic ash saba! great that you're back! Hope you're feeling better now! 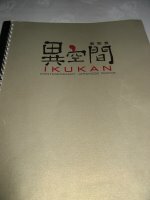 It's been a while since I've been to Ikukan but your review has definitely convinced me to go again soon... And nice photos considering the challenges (not to mention mild embarassment) of public dinner photo taking! Let me know how you feel when you get the chance to e-mail. I'm so sorry guys for being so late to reply as it's really been crazy & I was out sick for so long that I have to catch up now. Sorry, all! Thanks so much to Kalyn & Stephen, it's great to see you guys here as you are such role-models for food bloggers! Ivonne - thanks, chickie! Er, psst ... I kinda am sometimes but I rather like to think I bring the everyman's review instead of the Oh, Jeeves, I dare say the top note of that ... roll eyes. Mumu - thanks so much! You should, it was great when we went! Hinata - I know what you mean. Sometimes you stop going to certain places because you think they are passe or over-rated and it's kinda nice to go back and rediscover it! I sure know about the embarrassment of taking piccies in restaurants - I still have a hard time with it! LOL, Shvetha ... you are so subtle ... LOL! Graeme baby, miss you lots and I swear I will speak with you soon. I will also go chase CK ... terrible!